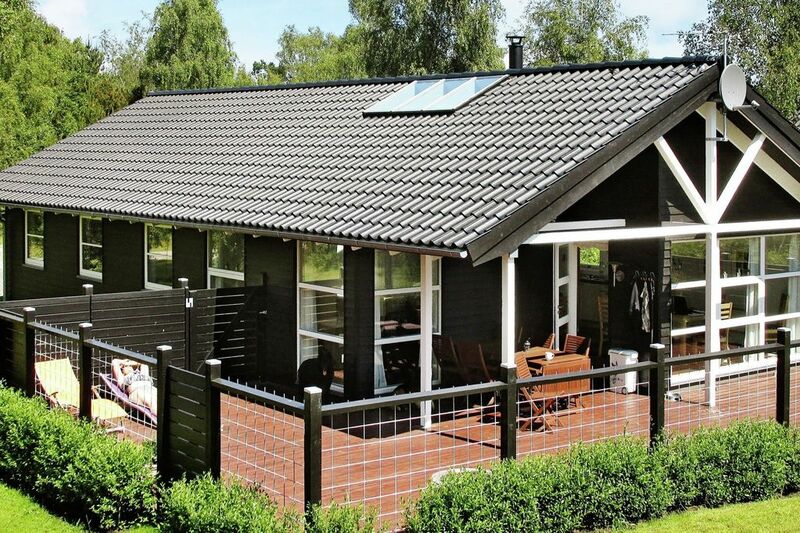 In quiet and peaceful surroundings in Helberskov pine and birch groves is this modern and functional holiday cottage. No letting to youth groups. The mild Kattegat coast provides ample opportunities to enjoy the beach. The house is located in Himmerland's lush and varied nature with vast forests, meadows, heaths, bogs, lakes and deep green gorges. The house has two bathrooms with underfloor heating, one with a whirlpool and sauna that can be enjoyed after a good hike in the area. There are three spatial bedrooms, with high-vaulted ceiling, TV, wardrobes and box mattresses. Kitchen, with all appliances, is combined with the bright living room with flat screen with mostly German channels and wood-burning stove for the cooler evenings as well as air condition. From the living room there is access to the partially covered terrace. From the terrace there is a clear view of the garden where there is plenty of space for ball games. The garden has a sandpit, swings and outdoor shower.